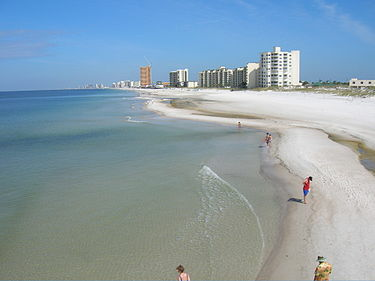 Welcome to popular Tidewater Beach Resort - built in 2008 along the white sandy beach of Panama City Beach. The Resort has 2 outdoor and 1 indoor pool, 2 hot tubs outside and 2 roman spas inside, tiki bar, auditorium that plays family movies for free, fitness center with state of the art equipment and even a small cafe! You can walk to nearby Pier Park where famous beach restaurants such as Margaritaville and The Back Porch figure prominently. Pier Park, a pedestrian friendly shopping mall has many boutiques, bistros, and name brand famous stores. Unit 1413 is a beauty featuring an open concept living plan. From the spacious family room you can watch the views of the beach and gulf of mexico! The kitchen comes fully equipped and there is even a washer/dryer for your use. There is a separate dining area and a breakfast bar for quick meals! There are 3 flat screen TVs and Wifi to enjoy. Both Master Bedrooms have private full baths and the bunk alcove has a full bath, too! This condo sleeps 8. You'll fall for the Resort, the condo and want to return year after year! Panama City Beach Vacation Rental : Florida Beach Condo For Rent By Owner, VRBO.